You plan to deploy App1 by using ClickOnce. 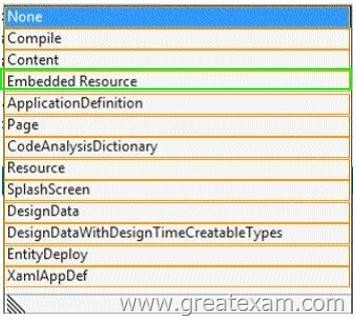 – The assembly that contains App1 must be visible from a COM component. – Each time Appl runs, an End-User License Agreement (EULA) must appear. 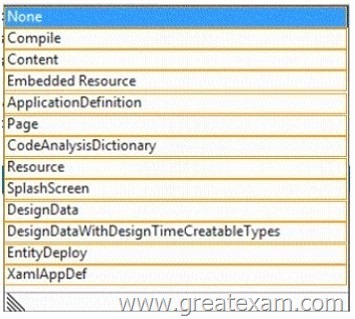 -App1 must be able to open files on local drives if the application is deployed from a file server. – App1 must be prevented from opening files on local drives if the application is deployed from a Web server. You are creating a screen named NewsList that contains a ListView control. – NewsList must display data from an object named News. – Each item displayed in NewsList must use a data template named dataTemplatel. – NewsList must be displayed by using a grid that has a maximum of four rows. You need to identify which property to use for each requirement. 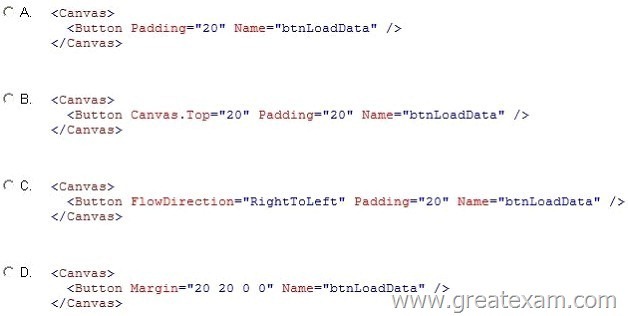 On a canvas, you have a Button object named btnLoadData. You need to ensure that the button is positioned 20 pixels from the top side of the canvas and 20 pixels from the left side of the canvas. You have a method named Method1. Method1 accepts a string parameter named param1. Method1 performs a complex operation on param1. You load an array of strings to a variable named array 1. The array contains 1,000 items. You need to ensure that other methods that call Method1 can use multiple processor cores when they execute. You have a method named Method1. Method1 accepts a string parameter named param1. Method1 performs a complex operation on param1. You load an array of strings to a variable named array1.